This crossword puzzle appeared in the October 1963 edition of Electronics World. About half the words used are related directly in some way to electronics or physics. My RF Cafe crosswords, BTW, have 100% of the words directly related to the sciences. Enjoy. 1. Incombustible residue left after burning. 4. 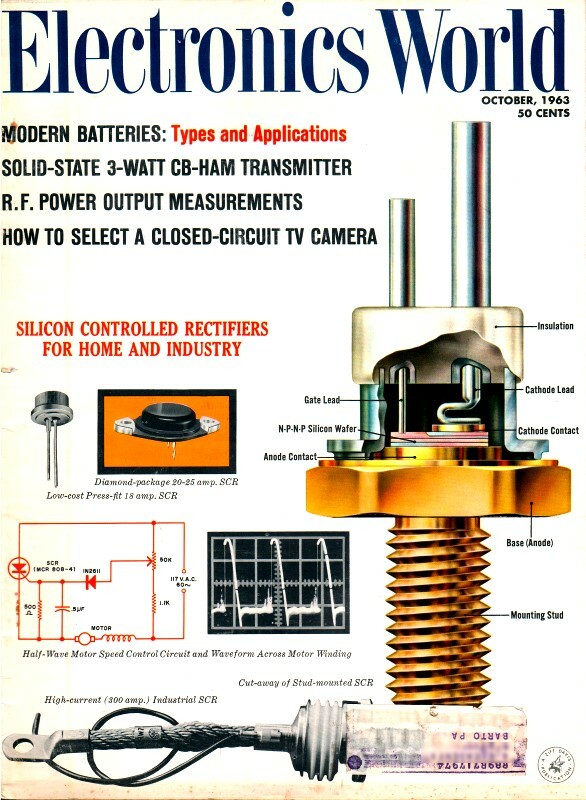 Types of potentiometer used primarily as an attenuator. 12. Chemical suffix denoting salt. 13. Type of FM detector circuit. 15. Circuit having parallel Rand C in one arm; series Rand L in the opposite arm. 19. _________ conductors: class of solid materials characterized by high resistance. 24. One electrode of a battery. 28. Tolerance value of silver in the resistor code. 31. Device having a tungsten filament and containing mercury or argon. 36. Visible lines on a TV screen. 45. Material used to maintain high frequency stability in a vacuum-tube oscillator of a transceiver. 52. Part ownership in a business enterprise (abbr.). 53. Term used to indicate that current is being taken from a voltage source. 54. Former name of the industry's engineering society (abbr.). 57. System based on primary units of length, mass, and time (abbr.). 6. Big body of water (abbr.). 7. Fishes in a particular way. 11. Make a right turn. 29. Suffix denoting chemical compounds. 32. Type of volume control. 45. Confirmation of radio communication among hams. 48. Top of a tube.